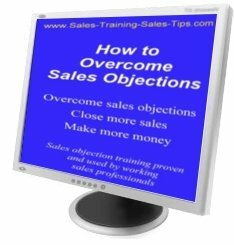 How to handle objections with the sales training workbook course the sales teams I manage and train use everyday to close more sales. This workbook training course shows you how to handle objections that are stopping you making sales, using a proven process. ...Is that what you want?.. A sales objections course developed in real sales situations not classroom role plays. While managing and training sales people in the field, I have developed and refined this process to make it easy for you to pick up and use today. The training can be quickly put into action by sales people, managers, and business owners. This step by step guide on how to handle objections is easy to learn and simple to follow. ...I use it with all my sales teams, so I want a course that's practical and fast.. ..No boring stuff that's too complicated to use in your everday role..
No rehearsed answers, no smart rebuttals, and no one reply for all sales objections. Works for any service or product you sell because the exercises build the process using your own words and phrases. The process method of how to handle objections then becomes specific for your product, and overcomes sales objections that are stopping you closing sales. If sales objections are holding you back, this course on how to handle objections will boost your sales, and the rewards you can gain. To read a review by someone who bought it and used it, open the review of How to Overcome Sales Objections then return here to read more on how to handle objections using the workbook training course. A compact workbook course, with 35 pages that guide you step by step through a proven process for how to handle objections. 12 exercises that show you how to use this course for your products and services, and how to overcome the sales objections you face. My support by email, if required, for any assistance you need while using the workbook. Plus a full money back guarantee if you complete the training and don't increase your sales results within 90 days. If this course helps you to overcome just one objection is it worth £14.99 to you? 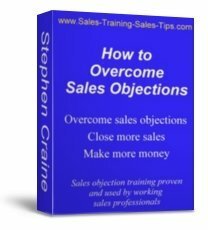 You can download this workbook course and start using it to overcome sales objections today. The instant download comes as a pdf eBook and is simple to open and save on any computer. If you have any problems with the download process you can contact me via the contact page on the website for assistance. All the pages can be printed separately or you can use the course on your PC. The exercises are within the course and also come as a separate word document to make them easier to use. You can use the exercises as many times as you like to keep improving your skills and for overcoming new objections. I’m so confident that you, like many other sales people, will be successful using this objection handling course, that I offer a money back guarantee. If in 3 months time you haven't increased your sales results all you have to do is return the completed course and I will refund the price. So you have nothing to lose and a lot you could gain with just one click. All payments are made through the Pay Pal website, so you can use credit or debit cards, or a Pay Pal account if you have one. Pay Pal is a secure site used by millions of people to make safe payments on the Internet.